Did you know that 65% of produce samples analyzed by the U.S. Department of Agriculture test positive for pesticide residues? Unless you’re buying certified organic food, the chances are that you’re consuming a significant amount of chemicals with every portion of your ‘healthy’ greens. The Environmental Working Group (EWG) is trying to inform the public about the level of exposure to often toxic chemicals commonly found in our fresh produce. They publish an annual list of most and least contaminated fruits and vegetables, the so called ‘Dirty Dozen’ and ‘Clean Fifteen’ lists. Apples, strawberries, grapes, celery, peaches, spinach, sweet bell peppers, imported nectarines, cucumbers, cherry tomatoes, imported snap peas and potatoes are all on the EWG’s Dirty list. You should be careful when consuming these produce, as they contain a number of different pesticide residues and have high concentrations of pesticides relative to other produce items. The cleanest fruits and veggies, which are least likely to hold pesticides, include avocados, sweet corn, pineapples, cabbage, frozen sweet peas, onions, asparagus, mangoes, papayas, kiwis, eggplant, grapefruit, cantaloupe, cauliflower and sweet potatoes. Avocados are the cleanest, with only 1% showing any detectable pesticides (you can find here more healthy reasons to eat avocado). How to Make Fruits and Vegetables Safer for Consumption? There is a simple and cheap trick that can help you get rid of those nasty chemicals. 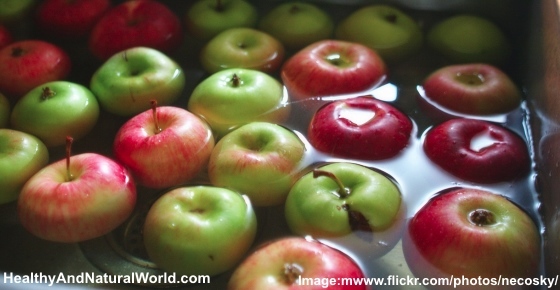 You can simply wash your fresh produce in distilled white vinegar and water solution. Gayle Povis Alleman, a registered dietician, suggests soaking your veggies and fruits in a solution of 10% vinegar to 90% water. Make the mixture, and let the produce sit in for 15 to 20 minutes. When you remove them, you’ll notice that the water left in the bowl is dirty and may contain some gunk. Rinse fruits and vegetables in fresh water, and then enjoy your cleaner product. This method shouldn’t be used on fragile fruits, such as berries, as they have a very porous skin and might get damaged and soak in too much of the vinegar. With other fruits, there should be no lingering vinegar aroma. If you wish, you can also use lemon juice. According to the Center for Science and Environment (CSE), it also helps to wash your fruits and vegetables with 2% of salt water. This should remove most of the contact pesticide residues that normally appear on the surface. In a scientific study, researchers washed cabbage for 20 minutes in vinegar, a salt water solution, or tap water to eliminate concentration of pesticide residues. The researchers found that vinegar and salt water solutions were significantly better than tap water in removing pesticides from the cabbage. They discovered that a 10% salt water solution was the most effective, and far better than washing with plain water. A new study from The University of Massachusetts, Amherst, suggests another method that may also be effective in removing pesticides from produce: soaking them in a solution of baking soda and water. The study checked the effectiveness of commercial and homemade washing agents in removing pesticide residues from apples. It was found that the baking soda method was more effective in removing surface pesticide residues on apples than tap water and bleach. The researchers mentioned that the standard post-harvest washing method (using Clorox bleach solution for 2 minutes) is less effective than baking soda and water. However, the researchers found that the baking soda method was not completely effective in removing pesticides that have penetrated into the apple peel. They found that the effectiveness of this method diminished when pesticides penetrated deeper into the fruit. The researchers concluded that washing apples with baking soda solution can reduce pesticides mostly from the surface of the apples. Generally speaking, you should be thorough when washing fruits and vegetables, as chemicals can linger in crevices that are hard to wash. The Center for Science and Environment claims that if done diligently, washing with cold water should be able to remove 70% to 80% of all pesticides. It is important to invest some time in preparing your food, as you don’t want to end up consuming a portion of toxins with your snack. The American Academy of Pediatrics issued an important scientific report in 2012 that said that children have unique susceptibilities to pesticide residues’ potential toxicity. By washing your food carefully, you protect the health of your whole family. Washing your produce to remove pesticides is also one of the 70 habits featured in my e-book 70 Powerful Habits For A Great Health which will guide you how to take positive steps to improve your wellness and overall health. Trisodium phosphate (TSP) in Cereal or In Food: Is it Really Safe? Very informative, good stuff, keep up the good work. I use this method alot, butwhat concerns me is the amount of pesticides that are absorbed into the fruit in the growing process – through the soil and roots, as well as the skin. I try to buy organic when possible. I have done this method with berries and have had no problem. It makes the berries stay fresher longer. There is no vinegary taste to the berries afterwards. I am concerned too that it removes all pesticides, wonder if it really works. have fruits/veggies been tested after this treatment? if so, did the tests show they were free of pesticides? my concern is that the pesticides are INSIDE the product, not just on the skin. Hi Naomi, buying organic is always the best option because some pesticides will penetrate peel and skin of some fruit and vegetable to some extent, but if people don’t have access to organic produce, they can still lower their pesticide intake at least from the outer layer and make it safer. This is why I’ve put a link to the “dirty dozen” fruits and veggies published by The Environmental Working Group (EWG) so people would be extra careful when consuming these produce. Which pesticides and what chemical are they please? There are many chemical formulas for pesticides but I’m not an expert in this field. I use an enzyme fruit & veggie wash from my natural nutrition store. You say that Mangoes and Papayas are among veggies holding least pesticides. But my stomach often gets upset with these fruits. Perhaps harmful chemicals used to ripen the raw fruits are soaked into them . One reason I buy organic (but not the only one) is that it’s simply more convenient and less time spent washing the fruits/veggies. Of course the rule of thumb though is that the thicker the skin the safer the produce inside is from chemicals. Kind of surprised me that cauliflower was on the safer list with this in mind. I tried this and others on the last batch of apples that I bought..they turned WHITE! And I soaked them again in another solution, and even THEN the wax wouldn’t come off 🙁 any other ideas? This is a slower method but works for me with apples. Pour a spoonful of table salt in your wet, cupped hand and twist the apple around in the damp salt with a little pressure. The salt is gritty enough to work on the wax. I have been doing this for many years. So easy. For apples I use a dab of dawn dish soap with Arm and Hammer baking soda and rub on skin of apple. Then I rinse with cold water and when you rinse that off you can feel it is squeaky clean, It even makes a squeaky clean sound. This is only for apples and other thicker skinned produce not for berries. The rubbing of dawn dish soap and baking soda is how I clean my shower. It is mildly abrasive and will take the wax off. It’s the only thing I know of that really works. No after flavor and I get to eat the skin. I come to the conclusion that nothing, absolutely nothing is safe, so, never assume ‘fresh’, ‘organic’, ‘pure’, ‘natural’ and even 100% this or that, never is, never will be. Unless you grow it yourself. The FDA should be held in contempt and charge not only for being negligent as well as promoting the consumption of contaminated, unsafe and dangerous productos. And that is downright criminal. I totally agree, the fact that monsanto is allowed to exist at all is completely criminal. Conflict of interest runs rampant, everyone is in bed with each other spreading their vile greed. Class action lawsuit…might work with a grand jury. Completely agree, the people have to put an end to these criminals like Monsanto, Dupont, FDA and the Government!! These greedy scums are killing our children and no one does anything about it. By the way all, I wrote a research paper about a year ago exposing the FACT that “organic” under any label, i.e., USDA, Kroger’s “Simple Truth”, you name it, is verifiably a complete FARCE. They are lying. What a close friend who is a contract food inspector informed me of first hand is produce is NOT differentiated between organic and nonorganic in the back of the store. Same same. And that is at the consumer end of the string of deception. I have talked with countless “organic” farmers who claim they certainly do spray their fruits and vegetables with pesticides, and it goes deeper. “organic” pesticides also are proven not to be so. As is or needs to be common knowledge, grow it yourself if you want to know the full process it’s been through, and KNOW it is indeed organic – at least as much as it can be. Soaking up pollutants from air, water, and soil is a whole additional issue with all this. Where does it stop? Is TRULY organic even possible anymore? The short answer is no, not really, except in very protected areas for the past several decades – make that since pre-WWI. Ever wonder what was done with all that nitrogen and other chemicals that were produced but not used overseas by American military? You guessed it, it went on [and continues to be applied to] ALL the cropland across the southeast and mid-west. I won’t even get started on corn here. Corn?? OMG… Nobody should still be eating corn or wheat. Very hard to stay away from since it is found on all kinds of food labels. Dr Oz frequently has guests on his show that are in the know due to their research or occupation or whatever, to warn us about something. The one expert on wheat was really startling since, according to him, wheat has been contaminated for decades upon decades!! I think most people have already heard about corn but way too many people are still ignorant and continue consuming it!! Thanks a lot for sharing this article. I never knew that 65% of produce samples analyzed by the U.S. Department of Agriculture test positive for pesticide residues. I appreciate how you explained how to clean produce in distilled white vinegar and water solution to get rid of pesticides. Luckily there are some organizations that take the eliminating of pesticides seriously. Thanks again. I have tried washing my fruit in the above mixture. I find that apples have a white film on them and find that nectarines and peaches skins go wrinkly. Anyone else have this problem? I am just guessing but maybe the white film is wax sticking to your solution. I have used the vinegar and water method quite a bit over the last couple of years since learning about it and find it works very well. I have not had the fruit tested so can’t say for sure everything is gone but I do think it’s as cleaned as any of the natural washes or enzyme sprays. I soak berries and other than raspberries which fall apart a bit just from handling, they hold up well don’t taste of vinegar and last longer in the fridge. After soaking apples I use a small vegetable brush to scrub the outside while rinsing in warm water and have never had a problem with them getting while or changing color and it sure seems any wax comes off when washing apples that have it to start. I also keep a spray bottle of vinegar and water handy to spray individual fruits and vegetables rather than filling a bowl or sink every time. Works just like the enzyme sprays! For the people talking about what concerns them – if what’s inside concerns you and you can afford organic or to grow your own, do so! I am looking up how to make the fruits and vegetables I can afford healthier, because, I, like many other people on this planet, can barely afford what is non-organic and is on sale! Being one of the terribly poor people of America, I greatly appreciate all information that might just help me to do more than barely survive. This method is true ONLY for washing off residue of pesticides applied “topically”. The fact is, ALL pesticides have been designed to be SYSTEMIC now for nearly 2 decades, meaning washing them will NOT get rid of the pesticides WITHIN them. This is a “fact” that can easily be verified by doing one’s homework & checking it out anywhere online or in any public library. So it’s misleading to think that washing conventional produce with this or any other cleansing product will make the conventional produce safe to eat – IT WILL NOT, because the produce was treated from the germination stage & the pesticides are all designed to be “systemic” as well as topical. This method does not aim to replace organic produce which is the best option. But for people who don’t have access to organic produce it’s still a safer option. “CSE claims that if done diligently, washing with cold water should be able to remove 70% to 80% of all pesticides”…….But doesn’t these fruits/vegetables get a thorough washing before they hit the store shelves? I would think so. In 1940 and early 50s in India our market bought vegetables used to be dipped in a bucket of water with a pinch of potassium permanganate in it. My father was doctor, a district health officer in what is now Bangladesh. Any body has such experience? Would you like to comment on it? I love the different options for washing! One tip from me (I think Jenny posted this too) is to wash ALL your produce, and even soak your nuts, grains, & seeds, in 3% Food Grade Hydrogen Peroxide. It contains no toxic stabilizers like the brown bottle variety so it cleans your food without a chemical reside and will rid your food of any pesticide reside! > it cleans your food without a chemical reside and will rid your food of any pesticide reside! It reduces the outer pesticides. Doesn’t do anything with the inner pesticides. Maybe somebody here knows which is worse. There are also ultrasonic cleaners. So…how about first thoroughly rinsing with a strong force of water, then soak in H2H2/vinager/whatever, then soaking them in an ultrasonic cleaner, then another thorough rinsing with a heavy flow of water. After about 3 hours you’re ready to start nibbling on the vegetables, not realizing all those inner pesticides are still there! Best option may be to sprout as much as you can and grow as much as you can. Grow the most expensive things you like! Buy the cheaper ones organic. Or it may be interesting to use the ultrasonic washer with vinegar, H2O2 or Potassium Permanganate. Clearly a low flow faucet is NOT your friend here. You want to blast that food as much as possible. “organic” and “natural” are two words that don’t describe any food no matter what. “Non GMO” is a silly joke. Everything we eat is a GMO. Humans select the crop that provides the most nutrition, and in that respect by selecting what genes are passed on we genetically modify all food. Whether you like Monsanto or not, GMOs will be the future of humanity.